IMO, this game received its ratings only because of nostalgia. Video game dunkey crushed the game with a 1/5 rating. Here is the video review of it. I may try to play it one day but in no real rush. I wouldn’t give it a 1/5, but I definitely agree with all of his points. It definitely has some glaring issues, I’m still enjoying it though. I also enjoyed FFXV at launch though and I’m pretty sure everyone hated that before some updates. So maybe I just enjoy shite games. still don't fully understand the story. First time playing any kingdom hearts game, beat the game and still don't fully understand the story. Played all of them...love 3. I’m playing them all on stream and I’m sure I’ll fall into the love catagory. Currently on RE: CoM and it has just made me realize how deep the story gets and how I would never be able to appreciate 2 fully much less 3 if I’m not doing what I’m doing. It’s like a 12 piece puzzle...if you only place 3 pieces down...you won’t see the big picture. Granted it’s not ideal how they have done it all but for $100 you get everything you need to probably appreciate it all more. I found the lore from the browser game Union X to be very very very good lore. It just requires a little research if you don’t plan on playing it but all the information is available. Dual keyblades was more fun than form change. I clearly should've spent the money and played the other games. That being said I don't mind reading wiki's to catch me up. Roxas is still cooler than Sora. He really hates Japanese RPGs though. There wasn't a single chance that the game (and the others like that he has reviewed) would review well. It'd have to be a 2D platformer for that to be the case. This whole game’s story sounds like some Japanese guy was just making up shite on the fly and they sent it right through the pipelines. I’ve seen the summaries, and it’s fricking stupid. I've played just about all of them. Can't say that I love 3. I still think 2 is the better game and best game in the series for that matter. The story is just so stupid though. Maybe it's because I am getting older, but my love for the franchise has kinda waned a bit after 3. FF XV is great too, highly underrated. Thankfully I never played any of the others then. If this is the best one...geez. Eh, it's debatable between 2 and 3 for me. 2 has a much better combat system as well as difficulty level. The dual keyblades are much more interesting than the form changes in 3. 2 also has better music. 3 combines pretty much every element of previous games' combat systems and puts it into one. You'd think that'd make it the best in the series, but there are a few flaws that make the experience less enjoyable. Namely how easy the game is, as well as you basically having access to the more important abilities early on in the game. Flowmotion from DDD, for example, is accessible right from the get go. Airstepping as well. (prob not the best examples, but I couldn't think of the other moves). Also, link attacks are so broken in this game, not to mention the Disney rides that you can use during battles. Basically, what I am trying to get at is the game puts in every effort to make the experience much easier for you, which I personally am not the biggest fan of. The story is also asscheeks, which most KH fans have known since post-KH2, but they really did a bad job with trying to cover up all of the loose ends in 3. Not to mention the post-credits cutscene and secret ending . Not sure this game was worth over a decade of waiting for. Oh well, lol. 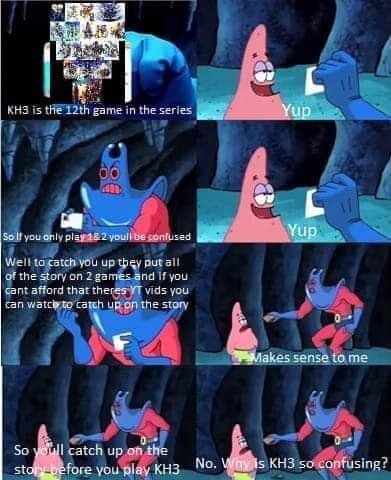 It's still KH I suppose.